Life is like a comedy. Don’t take anything too seriously or too personally, learn to laugh. Lighten up! Light is energy and energy is life, therefore enlightenment must be when we’ve lightened up. Think about it. Life is pretty funny. Read Malayna's Article about Comedy and Spirituality on Self Growth.com! Already, I have trouble taking Britain's Prime Minister seriously because he looks so much like a member of Monty Python. Luckily, I'm not British, but if *I* notice it, surely they do too! And aside from all the comedy that Sarah Palin provides on her own, she carries the last name of another fine Monty Python member, Michael Palin. So I think we should just elect the entire cast of Monty Python to rule the world. 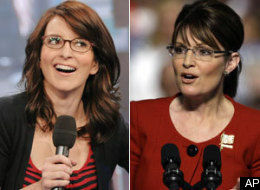 And maybe Tina Fey can marry Michael Palin and we'd have all that Sarah brings to the table and much more!